A love song of epick proportions.. Hip Hop with heart. Sweet, sultry vocals and raps over a beautiful beat that combines 60's soul and early 90's Hip Hop. Epick is a rapper/singer/songwriter/producer/performer who was born and raised on the Upper west side of New York City. He has been making music since he was in the Cathedral School Choir as a child, and has made commercial music for companies like Honda, Burton, Ecko, Volcom, and Sprite, in addition to releasing his own music independently. His debut EP Six Inches of Skill was called "really good" by all his family and friends and two of the songs from the EP were used by Honda for ad campaigns. He has filmed four music videos and his most recent video is for the single "I Don't Mind" ft. Elle King. The video features Epick in a lovingly dysfunctional relationship with a puppet and has very tasteful and clever animation by Jonah Oskow. 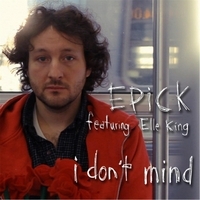 Epick is finishing up his debut full length album entitled 'A MILLION LITTLE LInES' to be independently released by no later than September 2013. For now, hopefully this single will satiate those in the world who would like some true love with their Hip-Hop. This song was originally released two years ago, but Epick didn't really mean it then. He does now. Thanks for listening and spread the word as well as the love!